Explanation: If you wait long enough, a piece of outer space itself will come right to you. As Colby Navarro worked innocently on the computer, a rock from space crashed through the roof, struck the printer, banged off the wall, and came to rest near the filing cabinet. This occurred around midnight on March 26, 2003 in Park Forest, Illinois, USA, near Chicago. The meteorite, measuring about 10 cm across, was one of several that fell near Chicago that day as part of a tremendous fireball. 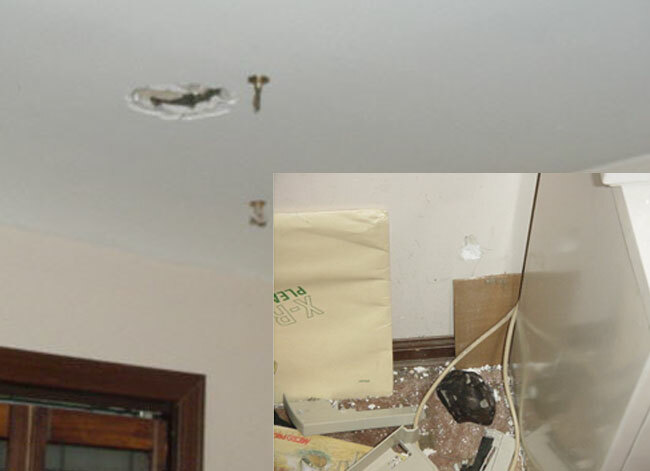 Pictured above is the resulting hole in the ceiling, while the inset image shows the wall dent and the meteorite itself. Although the vast majority of meteors is much smaller and burn up in the Earth's atmosphere, the average homeowner should expect to repair direct meteor damage every hundred million years.